If you’re lucky enough in your lifetime to do so, you should climb a volcano. If you’re really lucky, you should do so when it is (mildly) erupting, so that you can witness one of nature’s most awesome spectacles at close quarters. And if you’re a little foolhardy and a lot lucky, you might find yourself on top of a volcano during a serious eruption, which, when you think about the volatile and violent grandeur of such an event, will leave you feeling grateful that the whims of nature let you live to see another day. Last spring’s eruption of Mount Etna, which routed a party of BBC journalists and tourists with bombs of red-hot lava (their panicked flight recorded on film and dutifully fire-hosed on the internet), reminded me of an earlier expedition — similarly exhilarating, but with better luck. In the summer of 1977, Mount Etna entered a mild phase of eruption. I was living in Rome at the time. I had made a promise to myself during an earlier visit to Sicily that if Etna ever erupted while I was still in Italy, I would drop everything, jump on the next plane to Catania, and get as close to the eruption as I could. I was 26 years old and although I had no clue that I would eventually embark on a career in science writing, I rushed headlong into this adventure with an athlete’s conviction of physical invincibility and a twentysomething’s faith in improvisation. 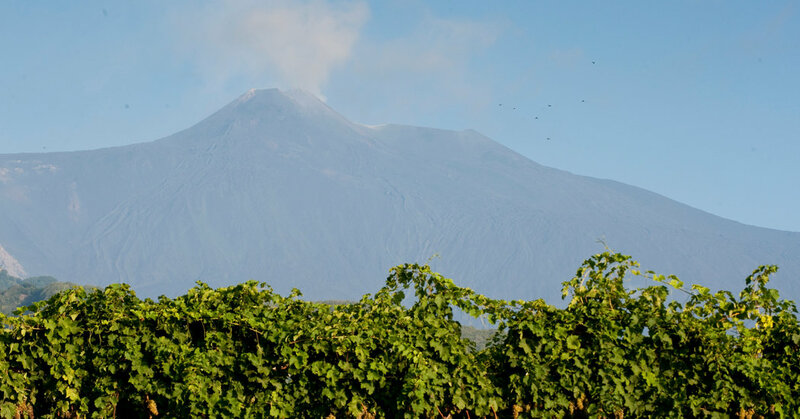 The following day, after an early morning flight, I found myself in Catania, staring up into a Mediterranean sky, Homeric in the brilliance of its blue — except for that little patch of sky near the top of the 10,808-foot volcano, marked by a smudge of gray. Like most of the things I did in those days, I didn’t have a plan. I took a bus from the airport to the city (its local architecture, fashioned from dark blocks of Etna’s extruded lava stone, can only be described as brooding), dumped my things in a cheap pensione, and caught the first bus to the Rifugio Sapienza. This refuge, at about 6,000 feet on the lower slopes of the volcano, serves as a lodge during — believe it — ski season, when Etna’s summit typically wears a crown of snow. As I walked across the parking lot, contemplating the suddenly dubious idea of setting off on a hike up the volcano in a pair of threadbare Adidas sneakers, I happened upon a group of journalists from the Italian television network RAI. A guide from Etna was about to drive them up to the site of the eruption in a vehicle adapted to the rugged, plantless terrain of the volcano. “Would you like to come along with us?” the guide asked. If chance favors the prepared mind, this was an example of proximity favoring fortune. “Certo!” I said, leaping into the back seat. The jeep bucked and heaved like a bronco as it slowly made its way up the so-called road. In the distance, we could make out puffs of dark smoke smudging the blue sky: the location of the active cone. This slow ascent through Etna’s wasteland gave me time to mentally tip my hat to the 19th-century British travel writer Augustus Hare. Hare had traipsed up and down a few volcanoes in his time, including in Sicily, and his shrewd eye discerned that the lava fields of Etna were not in fact the canonical black, but rather a black-brown. They say you never know how good another writer is until they write about something you know. I looked out upon jagged fields of unrelieved rock, extending in every direction — all of it precisely that black-brown hue. As we neared the active cone, the guide stopped the vehicle, and we went the rest of the way on foot. The first thing that impressed was not the sight but the sound. You don’t usually have an opportunity to hear the planet exhale, especially when it has a bad cough. Ahead of each eruption of slag, there was a deep — I mean seismically, rock-rattle deep — rumble of a cough. You could hear it, feel it through your shoes, sense the unworldly sound waves graze against the goose bumps even then rising on your skin. After a delay of a second or two, a molten blast of slag rose halfheartedly into the air (100 feet? no one wanted to get close enough to measure accurately), faintly glowing on the way up, cooling to dark gray as it fell back to earth in a clatter of igneous hail. Nobody brought a thermometer, either, but ejecta of that sort can easily start its skyward journey at about 1,800 degrees Fahrenheit, which would have burned a pretty good hole through my shirt — and right down to bone. Because this was Italy, there were, of course, a few moments of comic Fellini-esque relief. The fastidious Italian TV crew, bent on extracting every bit of seismic drama, had a cameraman focused on one very slowly advancing tongue of lava while the sound engineer lowered his boom mike over its leading edge, capturing every crick-crick-crick of the lava as it fell over itself, advancing at about an inch an hour. If there’s anything more boring than watching grass grow, it may be filming rock as it cools. But that wasn’t the only part of the show. Just beneath our feet, visible through those potholes in the newly cooled lava, you could see a river of incandescent liquid rock flowing at a more inexorable clip. Repeat: liquid rock, in full purgatorial glow, inches below your feet. It was like peering into an alternative world of everyday physics, staring backward into a geologically embryonic time. The heat was palpable. Our guide — reprising, I’m sure, a parlor trick he had performed many times — dipped a piece of split wood into the river of lava. It did not catch fire; it exploded instantly, combustion on steroids. “Impressionante!” exclaimed the RAI cameraman. Twenty-somethings don’t typically pay much attention to danger; I was no different. I stood at the lip of one of those potholes, marveling at the sheer improbability of rock become fluid, and thrilling to be so close to it. At one point, I almost got too close — I stumbled on a sharp rock, lost my balance and fell close to one of the potholes. Happy to say, I struck the landing; if I hadn’t, it is neither hyperbole nor metaphor to say I could have been toast. The guide shouted “Careful!” I won’t say the soles of my old shoes melted, but there was an odd-yet-familiar smell in the air, like the odor of spilled food in an oven that is warming up. The moment passed. I didn’t really consider until later that the thin shell of cooling lava on which I stood could perhaps have cracked under my weight, or been suddenly weakened by a superblast of heat from below, or that the nearby mouth of the eruption could have unexpectedly gone ballistic, hurling red-hot bombs of lava down upon us (last spring, tourists were struck by superheated fragments of rock that exploded when lava contacted snow). I did not consider any of those things. I was grateful to come right up to the lip of the planet, a glimpse of Earth as a work in progress, something we usually see only in National Geographic or on the Discovery Channel. I got to feel the heat, and hear the belch of eruption, and feel, a few steps removed, the volcanic spasms of the planet remaking itself — something it has done pretty well for 4.5 billion years, largely out of view from our prying and imprudent eyes. And I’m grateful to have walked away intact. When you sidle up to the edge of nature, you cross into a zone of proximal admiration; you also cross into the land of probabilistic danger. Red-hot ordnance falls out of a clear blue sky; the thin platform of lava gives way; majestic seas become the drowning wave; the beautiful stillness of the storm becomes the shredding motion of the tornado; the exhilaration of altitude crosses into anoxia. I crave the thrill of admiring nature in the raw; it reminds us that we live on a planet. But, as I began to understand on Mount Etna, I never forget the luck. Stephen S. Hall, whose most recent book is “Wisdom: From Philosophy to Neuroscience,” received the AAAS Kavli Science Journalism award in 2016 for magazine writing.